I'm not really sure if this is the correct place for this question, but as Wand relies on MagickWand, I assume that it is at least relevant here. If not, please move it. I am trying to extend Wand to allow this functionality. 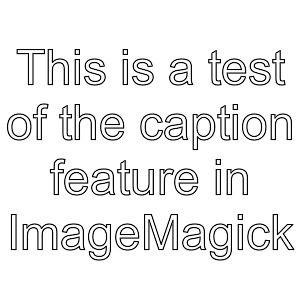 The code for adding a caption is located in image.py in the Wand library. This file can be found here: Wand GitHub repo. I have so far tried to extend this code using the functions DrawSetStrokeColor and DrawSetStrokeWidth (thanks fmw42). The colour and width of the stroke are arbitrary at this point. Assertion failed: (wand->signature == WandSignature), function DrawSetStrokeColor, file wand/drawing-wand.c, line 5306. I am pretty sure this is because I am not performing the draw operations on a DrawingWand. I have tried to create one, but get an error, and I have also tried to create an instance of the Drawing() class in Wand, but this fails because drawing.py imports image.py, so I cannot import drawing.py from image.py. I would be really grateful if someone could hint to me a viable way to solve this problem. I'm not a particularly strong programmer and I feel like I am banging my head against a wall! I found an answer to this issue on StackOverflow.